Dec - 20 | By: Oregon Film | 7 comments. Last Friday our office presented some important information regarding the Oregon Production Investment Fund and the Greenlight Oregon Labor Rebate and those programs’ performance over the last few years. I feel it’s best to share that information on our blog at this point so you all can have a place to find the presented information. Since 2007 up to present day (January 1 actually), the total amount of direct spend in Oregon on “OPIF and Greenlight qualified” Film and Television Projects amounts to $178,525,405. The direct and indirect impact on Oregon’s economy was $349,909,794. Projected through December 31, 2011 we predict the total amount of direct spend to be $275,000,000. Direct and indirect impact on the state’s economy is projected to be $541,861,324. In addition, the Greenlight Labor rebate has brought in over $30,000,000 in commercial production to the state of Oregon. By the end of next season (their 4th total and 3rd in Oregon), the total amount of direct spend in Oregon will be over $75,000,000. 471 Local Hires were put on payroll during the season. Collectively those employees worked 204,938 hours. In addition, over $350,000 was spent hiring locals to be extras or background performers. I believe these figures demonstrate the wide impact of OPIF and Greenlight programs which is why we feel the programs are worth continuing. It is true that the incentive programs are designed to recruit film and television productions to our state but the impact goes far beyond this particular industry. Currently there are 41 states with film incentive programs and Oregon ranks in the lower third of those states in terms of the amount of money we offer as an incentive. Despite the fact that Oregon has chosen to not go as far as some aggressive states, we are able to pool our other advantages to land our share of projects. We feel that if we can just be in the conversation when a project is looking for a location, we can land the ones who see the many values of our state. OPIF and Greenlight allow us to be in the conversation. While there are changes brewing in the motion picture industry, one thing is clear, it’s not going away. Quite the contrary: it is still a $13+ billion net exporting industry for the U.S., and there are specific reasons why this industry can not pack up and move to China or India (language and geography to name a few). The motion picture industry also is a clean industry. You do not have to worry about a film polluting a community’s water supply nor a television series asking the state to build a road. 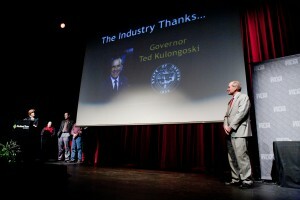 Oregon’s creative capital is at an all time high, and OPIF and Greenlight deserve some of the credit. More and more people from around the country and around the world are taking notice which in turn means more investment and more work. We’ve only scratched the surface of what’s possible and we look forward to a bright future for Oregon’s creative industry. I was bored today, so I was perusing IMDB on every film done in Portland, Oregon. Anything remotely good was Gus Van Sant. Everything else was….meh. Which isn’t to say that having a burgeoning film industry means the films have to be good; but they do if you’re marketing yourself as having ‘creative capital’. I would disagree that only Gus Van Sant has made good movies in Oregon. This year six films from Oregon have made it into Sundance. “Meeks Cutoff” is the first film that I know to have screened at the Venice Intl. Film Festival, Toronto, and Sundace. 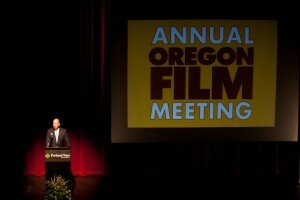 I also think you have to look beyond film to understand the creative capital Oregon has. The film industry does not have a monopoly on the “creative” label. Weiden + Kennedy was named Ad Agency of the year for 2010, the indie music scene is highly respected, and at least three local writers had their novels optioned for movies this year. I would consider that pretty good. Add in the thriving animation community and you have a well rounded creative industry which is something worth celebrating. Creativity is subjective I know but there are still plenty of great examples that Oregon has creative capital right now. As I am intimately involved in the advertising work and highly appreciate our local music scene, I in no way meant a lack of creativity on those fronts. I was specifically speaking to the film industry. Can you post the name of films that you thought were good that were made in Oregon and not Gus van Sant? (I have already thought of one that I own: Kelly Reichart’s Wendy and Lucy. Yet and still, that is only one.) Additionally, this would be a much richer dialogue if you would share your knowledge and tell us those six 2010 Oregon created films that you thought were good. Assuming you include documentaries in the discussion about film, you have many talented artists. Irene Taylor Brodsky has been nominated for an Academy Award for at least one of her films (“The Final Inch”). I think you also have to include “Coraline” into the discussion since it was nominated for an Academy Award. I expect more great work to come from LAIKA in the future. can you refer me to someone who can verify the credibility of a modeling talent agency called The Colleen Bell Agency in West Linn. Are they good and solid Talent agency with AFTRA and SAG hookups? I would recommend that you contact SAG or AFTRA to get this information directly. AFTRA’s branch in Portland can be reached at (503) 459-9118.